So January is over already - though I don't mind as I've been getting very excited for a few weeks now about my hen do this coming weekend! Everything is a complete surprise (apart from the fact I'm away for two nights); my best friend has organised everything and I know I will have an amazing time if she's got anything to do with it! The end of a month always means an empties post and I absolutely love writing these! Here's what products I used up in January. This is the old packaging of this creamy body wash and it is now called the Cocoa Butter Shower Cream. I really like the formula of this but the I'm too fussed on the scent - it was more sweet than buttery, which I would have preferred. Re-purchase? No - but I do have another to use from a Christmas set. I had to include this because it makes handwash a whole lot more interesting! Love, love, love the sweet bubblegum scent and the bright blue colour. It's often on offer for £1.00 too in Boots and Tesco. Re-purchase? I now have the Cola Bottles one to try! I absolutely love this perfume as it's a mixture of my favourite types of fragrance - fruity, floral and woody. The woody base notes gives it a musky edge, which makes it perfect for evening wear. I feel a bit ashamed about this empty - I've used it for wayyyy longer than the recommended 12 months! The can is huge though and you hardly need any for normal hold. But really this is meant for those who want "hard hold" because it practically freezes the hair, which was just too much for me. Re-purchase? No, I've bought a Schwarzkopf G2B one. I'm so sad this has run out because it's one of the best moisturisers I've tried. The Omega 3 Oils and Hyaluronic Acid make my skin hydrated, re-balanced and look generally healthier. Full review here. This was released in the Christmas 2013 collection but I only got round to using it last year. There is a bit left, but it just seemed to stop working for me and couldn't fix my dry lips. The ginger scent is gorgeous though. Re-purchase? No as it's no longer available. I love my body scrubs, especially when they're really scrubby like this one! It's organic, made from sugar granules and has a really invigorating scent, which makes it a winner for me. I picked up this sample from my local Space NK after being colour matched to Mont Blanc. I love the satin matte finish and the fact this gave me medium to full coverage. You can read my full first impressions of this here. With a sweet coconut scent, this cube is for when you want a simple, fuss free bath. There's not much more to say about it - it's nice but not exciting. Re-purchase? As it's so cheap, yes I would. What products have you used up this month? Are you a fan of any of the ones mentioned in this post? I adore the Bubblegum hand soap, its the only one we have in the house now! Eeeep, so exciting that your hen-do is coming up! I'm going to organise my own - such a control freak, I know. ;) I want to try a bubblegum handwash and I looooved HealGel Face too! 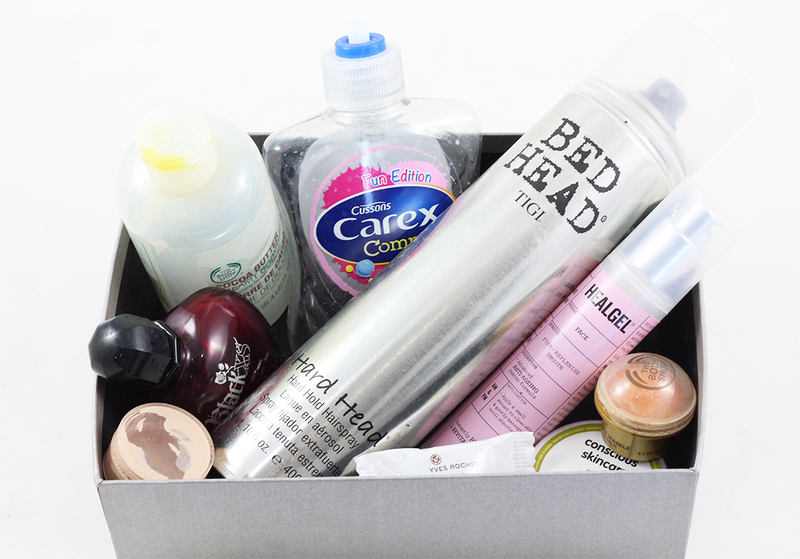 Lovely bundle of empties! A ginger scented lip balm is such a great idea! I hope you have a blast on your hen do - super exciting! A good mix of empties this month :) I really like the sound of the Tigi hairspray, my hair loses style so quickly.